Cache memory, also called CPU memory, which is random access memory (RAM) that a computer microprocessor can access more quickly than it can access regular RAM. Thismemory is typically integrated directly with the CPU chip or placed on a separate chipthat has a separate bus interconnect with the CPU. The basic purpose of cache memory is to store program instructions that are frequently re-referenced by software during operation. Fastaccess to these instructions increases the overall speed of the software program. As the microprocessor processes data, it looks first in the cache memory; if it finds the instructions there (from a previous reading of data), it does not have to do a more time-consuming reading of data from larger memory or other data storage devices. Most programs use very few resources once they have been opened and operated for a time, mainly because frequently re-referenced instructions tend to be cached. This explains why measurements of system performance in computers with slowerprocessors but larger caches tend to be faster than measurements of system performance in computers with faster processors but more limited cache space. Multi-tier or multilevel caching has become popular in server and desktop architectures, with different levels providing greater efficiency through managed tiering. Simply put, the less frequently access is made to certain data or instructions, the lower down the cache level the data or instructions are written. Direct mapping, in which each block is mapped to exactly one cache location. Conceptually, this is like rows in a table with three columns: the data block or cache line that contains the actual data fetched and stored, a tag that contains all or part of the address of the fetched data, and a flag bit that connotes the presence of a valid bit of data in the row entry. Fully associative mapping is similar to direct mapping in structure, but allows a block to be mapped to any cache location rather than to a pre-specified cache location (as is the case with direct mapping). Set associative mapping can be viewed as a compromise between direct mapping and fully associative mapping in which each block is mapped to a subset of cache locations. It is sometimes called N-way set associative mapping, which provides for a location in main memory to be cached to any of “N” locations in the L1 cache. In addition to instruction and data caches, there are other caches designed to provide specialized functions in a system. By some definitions, the L3 cache is a specialized cache because of its shared design. Other definitions separate instruction caching from data caching, referring to each as a specialized cache. Other specialized memory caches include the translation lookaside buffer (TLB) whose function is to record virtual address to physical address translations. Still other caches are not, technically speaking, memory caches at all. Disk caches, for example, may leverage RAM or flash memory to provide much the same kind of data caching as memory caches do with CPU instructions. If data is frequently accessed from disk, it is cached into DRAM or flash-based silicon storage technology for faster access and response. In the video below, Dennis Martin, founder and president of Demartek LLC, explains the pros and cons of using solid-state drives as cache and as primary storage. Specialized caches also exist for such applications as Web browsers, databases, network address binding and client-side Network File System protocol support. These types of caches might be distributed across multiple networked hosts to provide greaterscalability or performance to an application that uses them. L1, L2 and L3 caches have been implemented in the past using a combination of processor andmotherboardcomponents. Recently, the trend has been toward consolidating all three levels of memory caching on the CPU itself. For this reason, the primary means for increasing cache size has begun to shift from the acquisition of a specific motherboard with different chipsets and bus architectures to buying the right CPU with the right amount of integrated L1, L2 and L3 cache. Contrary to popular belief, implementing flash or greater amounts of DRAM on a system does not increase cache memory. 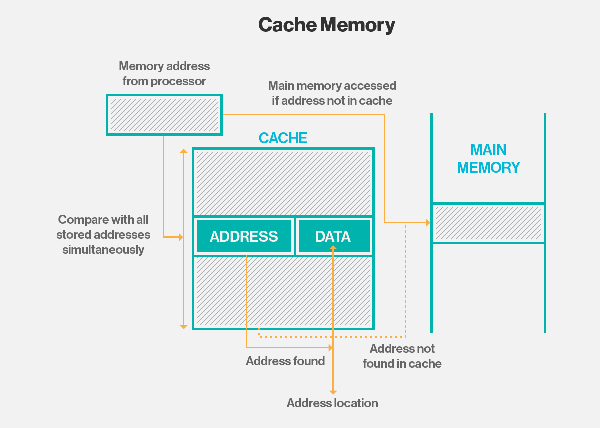 This can be confusing since the term memory caching(hard disk buffering) is often used interchangeably with cache memory. The former, using DRAM or flash to buffer disk reads, is intended to improve storage I/O by caching data that is frequently referenced in a buffer ahead of slower performing magnetic diskor tape. Cache memory, by contrast, provides read buffering for the CPU. Previous Post:well in advance of the wedding day.